Exceptional students deserve exceptional educators. The University of Georgia, known nationally for its superior undergraduate learning environment, has completed a major presidential hiring initiative to enhance the student experience. The Class of 2022 entered UGA with record-setting academic credentials: an average high school GPA of 4.04, an average ACT score of 30 and an SAT average of 1365. An increasing number of these students now state their interest in degree programs such as computer science, management information systems, finance, financial planning, engineering, statistics, biology, biochemistry/molecular biology and international affairs/political science. Targeted hires in these areas of interest include 26 faculty and staff: 10 tenure-track faculty, 10 lecturers and six academic advisors, all of whom will support students in high-demand areas. Kaixiong Ye, a tenure-track assistant professor of human genetics hired as part of the initiative, is enjoying getting to know his students. For Ye, creating the best student experience possible starts with active learning. His field of research centers on computational and human genomics, and he plans to include undergraduates in his work on nutritional genomics in his new lab, in addition to graduate students and postdocs. This semester, Ye is setting up his lab, starting research with his students and preparing to teach courses in genetics starting in spring 2019. 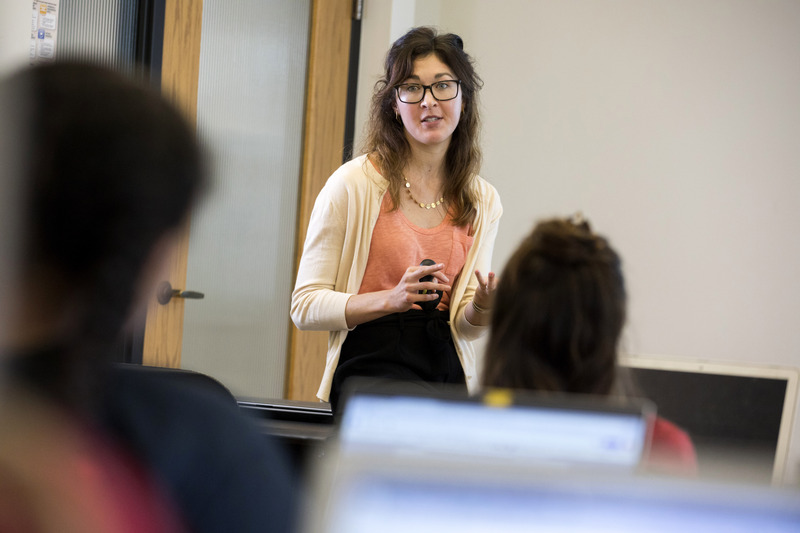 For Megan Turnbull, an assistant professor in the School of Public and International Affairs who also was hired through the initiative, enhancing the learning environment starts with open discussion. Another strategy she’s using is to stage a debate, of sorts, where students on different sides must come to a compromise. She also finds group work helpful and plans to incorporate an activity where students rank the quality of democracy in various countries to help them understand how democracy is measured. The Investing in the Student Experience hiring initiative continues a series of strategic investments started five years ago to strengthen even further the university’s world-class faculty. Past efforts have helped to reduce class sizes, expand research in key areas of strengths such as infectious disease and informatics, and foster interdisciplinary scholarship and education on campus. In addition to Ye and Turnbull, the tenure track faculty hired as part of the initiative includes Jin Ye, College of Engineering; Ross Marklein, College of Engineering; Kristy Archulet, College of Family and Consumer Sciences; In Kee Kim, Franklin College of Arts and Sciences; Yuan Ke; Franklin College of Arts and Sciences; Ramiviyas Nattanmai Parasuraman; Franklin College of Arts and Sciences; Xia Zhao, Terry College of Business; and Ankita Garg Jaiswal; College of Veterinary Medicine. Lecturers hired as part of the initiative are Benjamin Fahrman, College of Engineering; Adam Wineland; College of Engineering; Robert Schneider, Franklin College of Arts and Sciences; Joshua King; Franklin College of Arts and Sciences; Maduranta Dassanayake; Franklin College of Arts and Sciences; Jin Kyu Lee; Franklin College of Arts and Sciences; Magdalena Matuskova; Franklin College of Arts and Sciences; Brian McKay, College of Public Health; Jeffrey Glas, School of Public and International Affairs; and Johannes Kohler, Terry College of Business. Advisors hired as part of the initiative are Joshua Cooke, College of Engineering; Aaron Stone, Franklin College of Arts and Sciences; Kathryn Veale, School of Public and International Affairs; Olivia Myers, Terry College of Business; Anna Williams, Vice President for Instruction; and Cindy Schulman, Vice President for Instruction.